Olaya Towers is a development in Riyadh. Its name is taken from the northern district Olaya, which is the new financial core of the Saudi capital city. This district hosts other important and famous sites and landmarks such as the Kingdom Centre. The development is composed of two towers. Tower A – the tallest one – is a 36-storey skyscraper, while tower B has 34 floors. Due to the district’s business and financial vocation, Olaya Towers are designed to welcome public and private offices and surrounded by a top-class shopping centre. Olaya Towers are provided with 4-levels underground parking with 2,100 parking places. Tower A is expected to host all Riyadh offices of the Human Resources Development Fund (HRDF) as well as potential additional tenants like private companies. 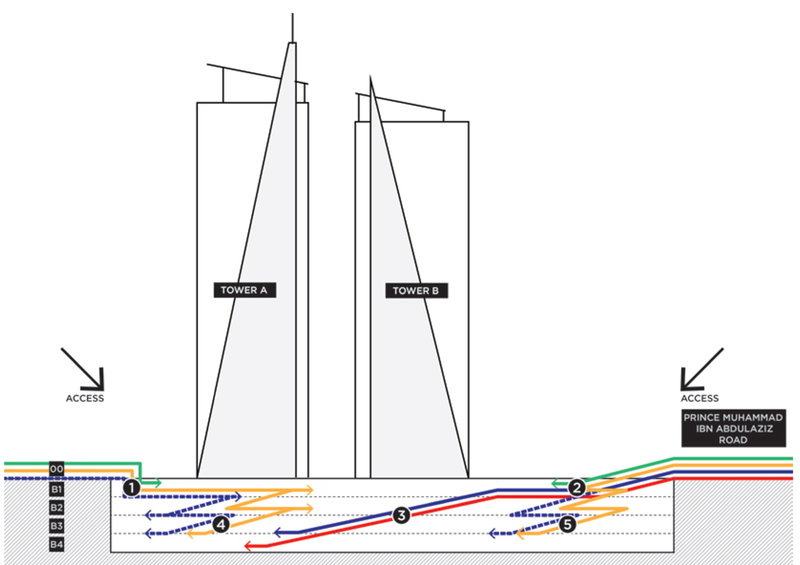 Systematica is appointed by Proger International SpA to support the “Fit-Out” schematic and detailed design of the Tower A of the Olaya Tower Complex in Riyadh (KSA), with detailed appraisal of the effectiveness of both vehicular / pedestrian access system as well as pedestrian internal circulation through innovative micro-simulation modelling. Systematica developed specific engineering consultancy aimed at ensuring an efficient, safe and convenient pedestrian accessibility and internal circulation, through the analytical verification of proposed internal layouts and public spaces, security control devices, access control points and the delivery of ad-hoc vertical transportation management strategy, specifically devised to reducing the average elevators’ ride time during peak hours and improving internal vertical connectivity. As part of the consultancy, Systematica carried out pedestrian dynamic micro-simulations aimed at scientifically evaluating with evidence-based results the suitability of the entire set of pedestrian strategies for both mid and long-term scenario, with the aid of leading edge modelling tools. 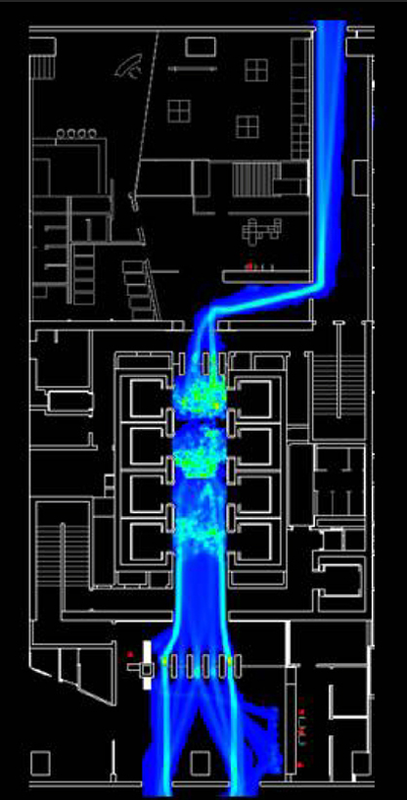 Moreover, Systematica developed a detailed dynamic simulation model to evaluate and analyse elevators management and performance level. 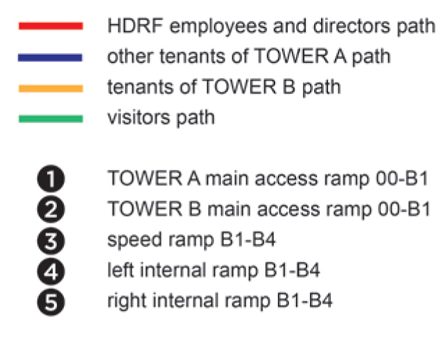 Concerning vehicular accessibility Systematica studied the parking configuration and circulation system to ensure the better accessibility to tower A employees and visitor without compromising ease of access to tower B and luxury retail area parking. 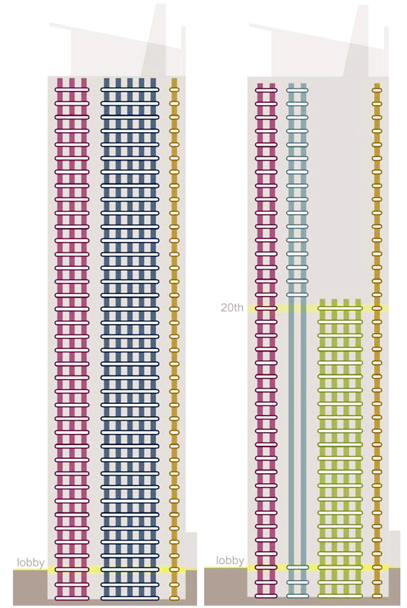 An ad-hoc vertical transportation management strategy was specifically devised to reduce average elevators’ ride time during peak hours and improve internal vertical connectivity.